Looking for a great twin (or two-child) carrier?! Look no further… We are delighted to stock this very clever carrier that allows parents and carers to carry two children at the same time. The TwinGo range is just that, and we can get you started with how to use it too (we are all trained professionals at Sling Spot). The TwinGo Air Teal is a great option for parents of twins or two children of different ages. It enables parents to carry two children simultaneously or divide the TwinGo so two adults can each carry one child! The ergonomic inward-facing position is healthy for your baby’s hip development and enables you to comfortably carry the added weight of two. Many parents are very pleasantly surprised how easy the TwinGo is to use and how well it distributes and balances weight so they feel far less weighed down than they had expected. The TwinGo Air is made of breathable mesh and lightweight fabrics to ensure that you and babies stay cool while babywearing. The TwinGo Air model has a mesh panel as the main panel for both the base and attachment carriers. The TwinGo Air also has a removable zippered panel, made from 100% cotton. You can simply attach this over the mesh panel during cooler weather, making it the perfect “all seasons” carrier! Base Carrier: This carrier has a grey/blue interior and a permanent set of shoulder straps. When in tandem-mode, this carrier is worn on the adult’s back. When in single-child mode, this carrier can be worn on the adult’s front or back. Attachment Carrier: This carrier has an grey/blue interior and a set of removable shoulder straps, included with this bundle. When in tandem-mode, the shoulder straps are removed, the carrier is worn on the adult’s front and attached to the shoulder straps of the Base Carrier. When in single-child mode, the shoulder straps are added to the carrier and worn on the adult’s front, back or hip. Comfortable: The TwinGo Air’s breathable and lightweight mesh keeps you cool while you carry your children. the TwinGo Air is an ergonomic design, and its 100% cotton exterior provides comfort for both you and your babies. 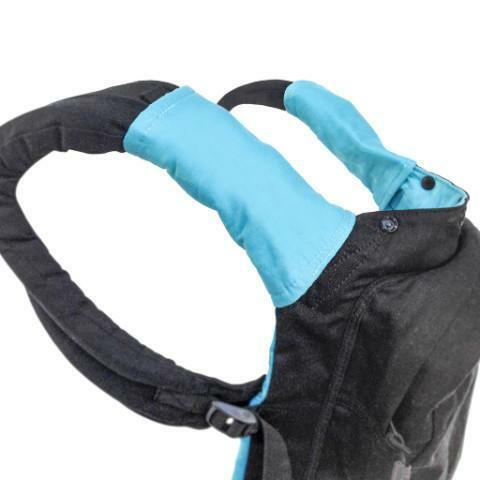 Adjustable: The TwinGo waist and shoulder straps enable for a custom fit for adults from 4’11” to 6’5.” This awesome twin baby carrier is suitable to carry children between 10lbs-45lbs, and as small as 7lbs with the TwinGo Infant Insert. Safety warning: Only use this carrier for children between 10 lb (4.6 kg) and 45 lb (18.2 kg), or 7-10 lbs with TwinGo Infant Insert. Children must face toward you at all times. Do not use the Back Carry Position with a baby younger than 4 months or with poor head and neck control. Dual carry weight not to exceed 70 lb (31.8 kg); seek a qualified physician for personal strength limitations. Read all instructions before assembling and using the soft carrier.